Yesterday was Waitangi Day, the closest thing there is to “New Zealand Day”. To celebrate I baked, for the first time, Afghan biscuits. This is a traditional Kiwi biscuit, with no known link to Afghanistan itself. The origin of the name remains a mystery, and the Kiwis are staunchly protective of this biscuit’s NZ roots. 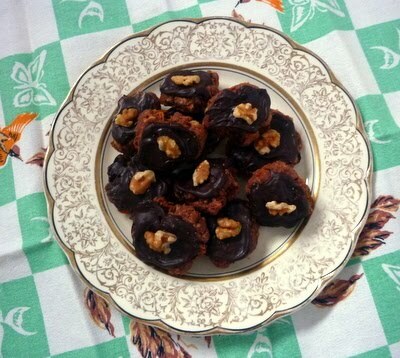 The Afghan is a chocolate cookie made with cornflakes and topped with a chocolate ganache and a walnut. It’s notable for its high quantity of butter and lack of raising agent so it melts in your mouth – perfect with a Flat White. I’ve used a recipe from TVNZ, but like all Kiwi classics it was probably first in the Edmond’s Cookbook. For any fellow Kiwis In London I’ve made a list of cafe’s and restaurants to get a bit of Kiwi kai and quality coffee.